Henry Ford’s Model T wasn’t the first car in America, but is considered the first affordable mass produced car. In his 1909 autobiography, Ford said he told his team that “Any customer can have a car painted any color that he wants so long as it is black.” Despite the pronouncement, the first Model Ts built from 1908 to 1913 weren’t offered in black, but rather, grey, green, blue, and red, depending on the car’s style. It wasn’t until 1914 that Ford established the black-only Model T, which continued through 1927. Ford’s color choice had everything to do with cost and production. If all cars were painted black, there would only be the need for one paint and one area for painting along a production line. Other auto manufacturers — and there were dozens — weren’t so limiting with their color choices. By the1920s, all car manufacturers were offering a multitude of colors. Cars like those produced by Duesenberg helped establish red or yellow as the colors of choice for sporty and fast cars, while green became a common color for touring cars, often associated with wealth. By the 1930s the roadways were filled with cars in a rainbow explosion of color. World War II helped change that. At the advent of the U.S. involvement in the War all car factories shifted to the war effort to manufacture trucks, tanks and bomber planes. After the War, rather than pick up where they left off, cars became more basic once again, generally available in dark shades usually associated with earlier times as the companies ramped up their production capabilities. By the 1950s, the growing Boomer Generation enabled car makers to get back in the color game in a big way. Soldiers home from the War got married and had children, creating the Baby Boom. This surge in marriages and population growth prompted an explosion in housing that established the suburbs, and, without the availability of urban mass transit, a strong auto market. By the mid-50s, auto makers were advertising affordable models as “second cars,” available in pastel colors meant to attract the women who found themselves home alone when their husbands drove off to work in their only family car. Though two-toned cars had appeared throughout the history of the American automobile, most agree that the zenith of two-toned cars hit the showrooms between 1955-57. Virtually every manufacturer offered two-toned cars in a wide variety of shades and tints, among them Chrysler, Chevy, Ford, DeSoto, Plymouth, Cadillac, Dodge, Studebaker, Buick, Oldsmobile and many more. Unlike the two-toned cars of earlier decades, though, these new two-toned vehicles distributed colors all around the vehicle, rather than merely a hood, trunk or roof in a contrasting color. They were designed to illicit feelings of progress and the future, with sleek lines and plenty of gleaming chrome. It was the adding of chrome moldings that often served as the outline of shapes along the sides of the cars, creating color panels. Interiors and convertible tops could be coordinated to contrast with the body colors or match them, which was a relatively new approach to car design. This 1955 DeSoto FireDome illustrates the transitional styling of early 1950s autos to the sleeker, flatter sides of mid-50s design. It also clearly shows an imaginative two-toned color breakdown, in shades not seen before that era. 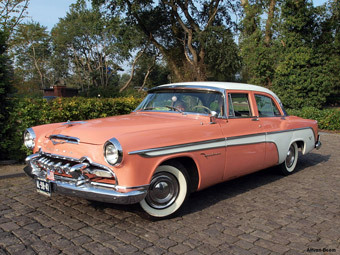 Chevrolet embraced the two-tone styling wholeheartedly to introduce its newly designed 1955 model. Gone were the bulbous fenders and rounded hoods of the post-war years in favor of flatter body panels, sculpted fenders and shaped bumpers and tail lights. Chevy had worked with DuPont and Ditzler to create a plethora of color choices, including metallic and metal flake varieties. By 1957 Chevy offered as many as 15 two-tone paint schemes, including the classic red and white still sought after in 1957 Chevys. Though Mister Boomer was a wee lad in the mid-50s, he distinctly remembers the two-tone cars because his father and several uncles had one. Mister B’s dad traded in his bulbous 1950 Ford, with its chrome bullet in the middle of its grill, for a brand-new 1956 Chevy in white and green. Mister B and Brother Boomer also loved the car’s styling because a rear tail light — itself a streamlined red plastic bullet shape nestled in a chrome cradle — swung open to reveal the gas cap. Mister Boomer’s uncles chose two-toned Chevys and Fords, ranging from a red and white 1955 Chevy Bel Air to a 1955 blue and white Ford Victoria; a classic 1957 Chevy in red and white to one of Mister B’s favorite car memories, a 1955 Chevy Bel Air in grey and pink. It’s hard to say why Mister B recalls these family cars so vividly, but chances are the two-toned paint schemes had a lot to do with them being etched into his long-term memories. Manufacturers continued to offer two-toned cars throughout the fifties, but by 1959, the solid color car — punctuated by chrome — became the norm. Today many car manufacturers are once again dabbling in two-tone paint schemes. Most often, it takes the shape of a lighter roof color. Will this catch on to become a new trend or are two-toned cars best left as the memories of an era when the future looked bright and anything seemed possible? Did your family have a two-toned car, boomers?